Embryology is a scientific study of prenatal development (formation of sexual cells), fertilization, and embryonic or larval development of an organism. Embryology forms the basis of developmental biology. The mechanisms which control phases of the life cycle which are contained within the genome and expression of genes and their products, in particular sequences, result in the morphological changes seen during embryo formation. 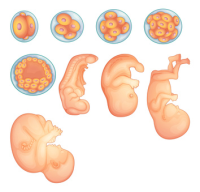 Embryology studies the interactions of molecules responsible for those morphological changes. Thus, its application in medicine is not limited to understanding of anatomy and histology but embryology also plays a significant role in research of hereditary disorders, corrections of congenital defects of development, creation of banks of tissues on the basis of cloning of embryonic stem cells and others. This science helps to distinguish embryology of animals and humans, as well as the embryology of plants. The embryology of animals and humans studies the pre-embryonic period also called progenesis (oogenesis, spermatogenesis), fertilisation, and embryonic development. Experimental embryology studies the development process by performing experiments on an organism. It uses such methods as marking, removal, transplantation, and isolation of body parts and organs. Ecological embryology studies the action of various external factors on embryonic development.